Kavisha Mazzella is an ARIA award winning singer songwriter who does not believe in world music.It's just music!!! Music unites us and creating imaginary titles such as world music is silly! She enjoys crossing musical boundaries and create community experiences in her shows.She first came to national attention with her appearance in the Franco Di Chiera documentary " Joys Of The Women" in 1993. Drawing on her rich multicultural heritage she creates contemporary songs with haunting melody and lyrical depth. While her early influences come from the singer songwriter tradition of the likes of Sandy Denny,Joni Mitchell and Leonard Cohen, over time due to her passion for italian regional folksong,she has absorbed influence from the East with its modal tones and ecstatic singing styles of Indian,Arabic, Southern Italian and Gypsy influenced song and links these with western folk music influences.Other influences that have made an impression on Kavisha's music are her interest in meditation and mysticism through the teachings of Osho ,Sufi ,Tibetan Buddhist Masters and Advaita teachings. She is a winner of various awards including the 1998 ARIA for her album " Fisherman's Daughter", Silver Hook Tango was Nominated for an ARIA in 2004. Kavisha recieved the Italia Nel Mondo Award in 2000 for her contribution to the sharing of Italian Culture in Australia through setting up of Italian Women's choirs and West Australia Music Industry awards for songwriting.In 2004 she was awarded PORT FAIRY ARTIST OF THE YEAR. In 2008 Kavisha was awarded Multicultural Commission Excellence award. In 2011 Kavisha was awarded an Australia Day Honour for her contribution to music and serving the community. FESTIVALS Her shows have people singing along before they know it. Since 1990, She has performed extensively and also run songwriting and choral workshops at music festivals such as Maleny,Woodford Folk Festivals and International festivals such as Edinburough Fringe,Cork Arts Festival,Australia Festival Dublin.Brunswick Music festival and Port Fairy. THEATRE; 1990-2003 Composed and performed for DeckChair Theatre Fremantle WA with Director Angela Chaplin . In 2011-12 Kavisha collaborated with one of India's top actors Arjun Raina and the Colonial ,the Convict ,the Cockatoo a show exploring Australian History.Kavisha collaborated with Author actor and storyteller Andrew Lindsay " Mermaids in the Well and the Devil's on my shoulder! "and with author Arnold Zable In the 2 man show" Anytime The Wind Can Change' inspiring tales of Australia's indigenous people,immigrants and refugees. CHOIRS:Since the late eighties Kavisha has also been collecting Italian popular and folk songs remembered by Italian migrants arranging them in Choral form to be sung and kept alive by the choirs 'Le Gioie Delle Donne (Joys of The Women) in Fremantle West Australia and "La Voce Della Luna" (Voice Of The Moon) in Melbourne(1996-2013) Victoria.She directs open community choir " The Moon's A Balloon " for all whose lives are touched by mental illness which is sponsored by WELLWAYS. Kavisha also leads "Coro Del Oro" Ballarat Italian Choir. Other Choirs include temporary choirs for festivals such as Way Out West Festival "SongNation" 2002, Woodford Festival Fire event choirs (1997-2001) Various festivals in Australia including Port Fairy Folk Festival , Sing For Water choir 2006 at the Melbourne Commonwealth Games Music Festival , Jonathan Welch's Melbourne International Singers Festival 2009 and 2019. "Kavisha sings with the voice of a heartbroken angel"
Whether working solo or with others,Kavisha has carved a strong reputation as a performer, songmaker, composer ,theatre worker and teacher.playing guitar,mandolin,piano accordian , it is her hauntingly beautiful voice,capable of power and nuance, humour and spontaneity on stage that makes no two shows alike. In her music the East meets West and tracks the journeys of many migrants in the world. 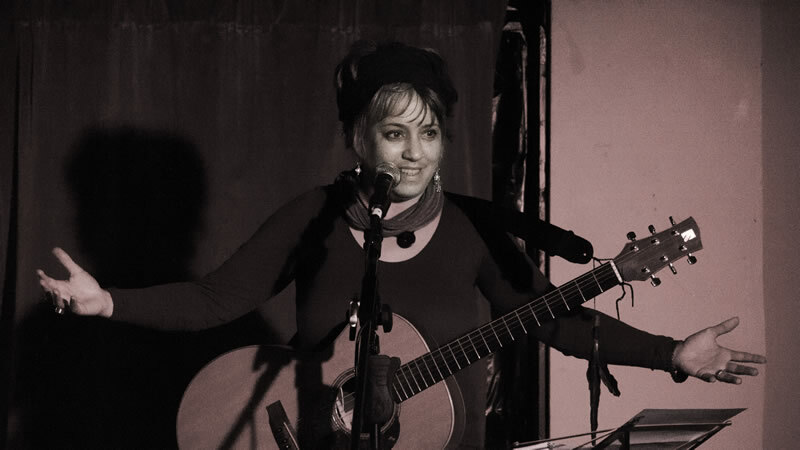 Singing in English and Italian, Kavisha's songs come from the heart and take you on a witty, joyful, poetic journey .She is currently based in Castlemaine Central Victoria , Australia. 2006-present Collaboration with Jazzplayers TREGUA with,Gianni Marinucci Danny Gordon,Ronnie Ferella, Nicolino Di Sipio. 1996 Greenroom Award For Musical Direction In Theatre For "Emma-Celebrazione!" 1998 Aria (Australia Recording Industry Award) Best Traditional/World Album For Fisherman's Daughter"
1999 Female Artist Of The Year @ Thredbo Global Music Awards. A 2001 Puc For Best Individual Artist In A Theatre Production For "Luna"
2002 Helpmann Award Nomination(Co-Written With Angela Chaplin & Kath Thompson) For Best New Australian Work For "Mavis Goes To Timor"
2003 A.F.I. Award Nomination For Best Score For "Rosa's Story"
For "East Timor, Birth Of A Nation" By Stella Zanataro And Luigi D'aquisto"
2003 West Australian Premiers Literary Award Nomination For "Mavis Goes To Timor"
"Mavis Goes To Timor" Shared With Angela Chaplin,Katheryn Thompson. 2003 Aria Nomination For Best World Music Album"Silver Hook Tango"
2011 Member of the Order of Australia for services to community and music,National Film and Sound Archive Award for Best Folk cd release for " Love and Sorrow" at the National Folk Festival. 2000 New Caledonia ,Femme Funk Festival ,Noumea. 2003 Ranges Folk Fest ,Womadelaide, Brunswick Music Festival. 2004 Chewton,Brunswick Music Festival,Port Fairy,National Folk Festival,Fairbridge,Rhythms Of The Outback Festival Kalgoorlie.,Famous Spiegeltent,Melbourne International Arts Festival. 2011 Brunswick Music festival VIC,Campaspe Downs music festival,Natimuk Fringe Festival, Two Fires festival Braidwood ACT.,Brisbane Italian week,Illawarra Folk Festival,Darebin Music Feast. 2013 National Folk Festival ACT,Denmark Festival of Voices WA,Nectar Festival WA,Natimuk Biennale,Woodford Folk Festival Qland. "I Came Without My Mother's Hand" and "Kan Yama Kan "
" The Colonial The Convict and the Cockatoo" music and performance.with Arjun Raina of Sohamasmi Performing Arts /Adelaide Fringe 2011-12 . "How the hell Did We get here?" Stories of the recent settlers of Castlemaine Phee Broadway Theatre residency . Musical Direction and performance 2018.